NuKit for Mac OS X is a bundle of lightweight everyday tools to increase productivity and save time. 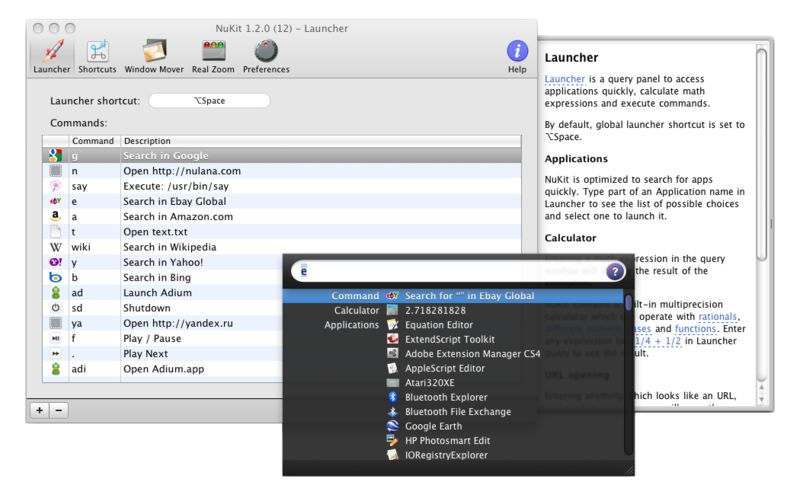 Launcher and Shortcuts provide instant access to applications, files, URLs, Search Engines, System Actions, Scripts, and Dictionary. Window Mover, Real Zoom, and Real Close help you to quickly and easily drag and resize, maximize and close windows on a Mac. Tweaker gives you access to hidden Dock appearance settings and Finder preferences. A bundle of lightweight everyday tools to increase productivity and save time. * Tweaker gives you access to hidden Dock appearance settings, Finder preferences and other system settings. * Advanced Calculator works with big numbers, rationals, math functions and immediately displays results in decimal, binary, octal and hexadecimal. * NuKit for Mac OS X supported languages: English, French, German, Japanese, Russian, and Spanish. * The fully functional 15-day trial version. Qweas is providing links to NuKit for Mac OS X 1.1.5 as a courtesy, and makes no representations regarding NuKit for Mac OS X or any other applications or any information related thereto. Any questions, complaints or claims regarding this application NuKit for Mac OS X 1.1.5 must be directed to the appropriate software vendor. You may click the publisher link of NuKit for Mac OS X on the top of this page to get more details about the vendor.